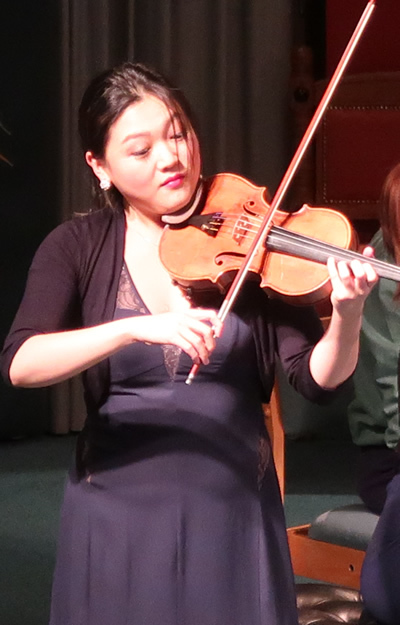 The last concert of the season was a stunning recital by two gifted young musicians – Emily Sun (violin) and Jennifer Hughes (piano). From the first notes of the Beethoven Sonata in G op.30 no.3 their intense and total involvement in the music grabbed the attention. Beethoven’s playful off-beat accents, lyrical moments and extrovert gestures were all captured with delightful ease. The slow movement drew mature, poetic playing from both performers and the bustling finale was despatched with humour and an immaculate sense of pulse. Poulenc’s Sonata from the 1940s is dedicated to the memory of Federico Lorca, murdered in 1936 as the Spanish Civil War started. Defiance, searing melodies and grief all drive this dramatic music and the performance ranged through every emotion with impressive commitment. Emily Sun produced ravishing tone throughout the evening from her fine instrument made by the highly-regarded Australian maker Arthur Smith in 1947. Never in any danger of being overpowered by the piano she yet created colours of every shade from Poulenc’s extrovert outbursts to the gentlest murmur in the slow movement and the desolate cries of the finale. Jennifer Hughes was an exemplary partner in this bitter sweet music. Mendelssohn’s Rondo Capriccioso followed in a transcription for violin and piano by Abram Yampolsky. Who can complain about such an arrangement when it is played with such heartfelt feeling in the lyrical introduction and such precise articulation and lightness of touch as it becomes capricious? A charming diversion. Schumann’s Sonata no.1 allowed both players to indulge a little – rich harmonies and sinuous melodic lines –an opportunity gratefully taken. Two shorter pieces concluded the recital. Tchaikovsky’s Valse-Scherzo is a show piece and once again Emily Sun demonstrated effortless virtuosity in entertaining us with fireworks and deeply expressive playing. Jennifer Hughes contributed her equally robust accompaniment and both artists showed immaculate stage presence all evening – an important element in any performance. Their calmer encore, Fauré’s Après un Rêve ended an exceptional concert.